Not sure if something like this has been done before, but thought I'd share the results of an analysis I ran of quickest lap times since 1996. So these are the quickest times of the weekend, whether they were set in qualifying (as in most cases), during practice (if e.g. qualifying was wet) or the race (as occasionally happened during the qualify with race fuel era). Why from 1996? Well that corresponds with Melbourne joining the calendar, which is the track of the 2017 season which has been substantially altered least recently (i.e. never; NB even Interlagos has changed in that time, with the Laranjinha corner reprofiled in 2014). A couple things to note. Obviously the further back you go the smaller the 'sample size'. i.e. 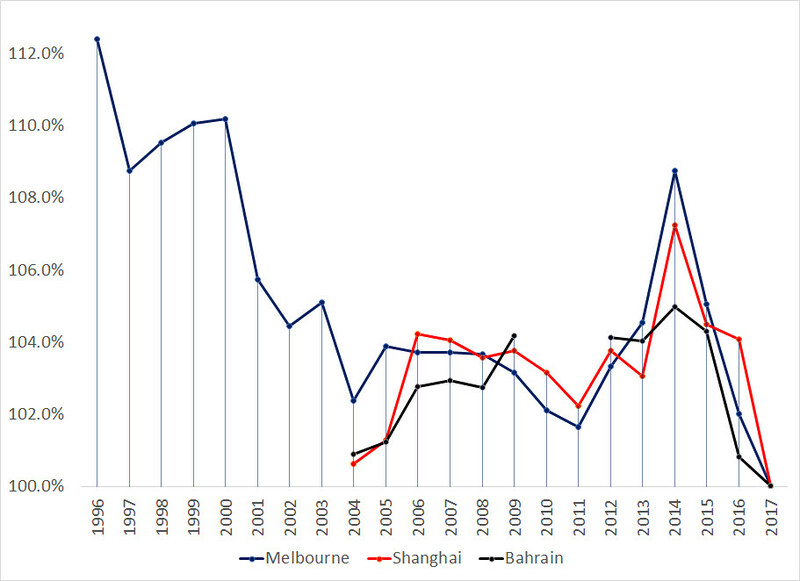 for 1996 the proportion is based off Melbourne alone, while for 1997-99 it's based off Melbourne and A1-Ring. This is important to note because, as I found out, performance differs wildly from track to track in terms of changes over time (for example between 2004 and 2006, cars got dramatically quicker at Suzuka, while slowing at Bahrain). And then things like weather, track conditions and time of year also play a part. In particular, it's likely that results for 2003, 2004 and 2005 would be much better than they're made out to be in this chart. That's because qualifying runs were set with race fuel and we didn't have low fuel runs in Q2 like we did in 2006-09 that would give us a very close, if not exact, read on the ultimate pace of the cars (I realise in 03 and 04 we had 'pre-qualifying', but times in this session were often improved upon in the real, race fuel qualifying, showing how much drivers were leaving on the table). 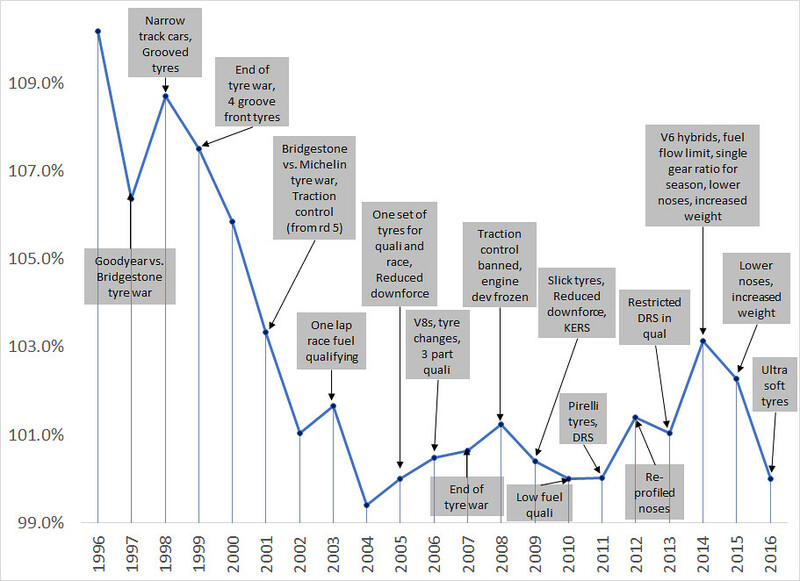 Note the dramatic increase in times with the switch from V10 to V8 engines, which had almost zero effect on Melbourne's times. Last edited by nate on Sun Apr 16, 2017 2:20 am, edited 1 time in total. This would be even more interesting going back to the run up to 1995 and the effects of Senna's accident on the authorities attempting to slow the cars. Run up to the end of the last turbo era would also be interesting. Agreed. I'd actually like to run it all the way back to 1950 when time permits (i.e. probably never), but it requires a bit of 'fudging' the numbers to do so given all of the track changes since then. Still, I like a good graph. I wonder if a graph of speeds rather than times would give any more visual information? I struggled at first trying to understand that more was slower/longer. Do you know the total distance for all the circuits in each year? That's definitely another way of doing it, and would probably be more understandable when going all the way back to 1950. I've just added callouts that show the key regulation changes from year to year. Funny thing is how much lap times improve when regulations are left more or less the same (look at the improvements from 1998 to 2004). Makes me wonder whether if we'd just left the regulations identical for 2017, we might be seeing more or less the same gains as we've gotten out of the overhauled width and aero regs. Funny thing is how much lap times improve when regulations are left more or less the same (look at the improvements from 1998 to 2004). Makes me wonder whether if we'd just left the regulations identical for 2017, we might be seeing more or less the same gains as we've gotten out of the overhauled width and aero regs. This is quite possible for some tracks. For example, in Melbourne, the fastest lap (for the whole week-end) was in 2015 a 1:26.327 (pole time), in 2016 it was a 1:23.837 (again pole time, so a gain of 2.5 seconds, or 2.9%), while in 2017 it was a 1:22.188 (again pole time, so a gain of only 1.65 seconds, or 2%), so I guess we would have seen this kind of improvement even without the regulation changes. The same goes for Bahrain where the 2015 pole was 1:32.571, the 2016 one was 1:29.493 (3.078 seconds, or 3.3% faster), while the 2017 one was 1:28.769 (only 0.724 or 0.8% faster). OTOH in China the 2015 pole time was 1:35.782, the 2016 it was 1:35.402 (only 0.380 or 0.4%) while in 2017 we had a 1:31.678 (3.724 or 3.9% faster). It's interesting that in China, there was little improvement in 2016 compared to 2015 (while on the other 2 tracks the improvement was significantly bigger). And the same track is the only one that showed a significantly bigger improvement from 2016 to 2017. I wonder if it's only a track specific thing, or was something going on last year in qualy (because the fastest race lap was 2.5 seconds faster in 2016 compared to 2015). Anyway, I find this topic of lap times really interesting and will follow this evolution pattern over the season. Fastest (or, better still, average) race laps would be a better metric than qualifying, since qualifying rules have changed so much. These days they qualify on fumes with a throwaway set of the softest tyres. A few years ago they were qualifying with full race fuel, and with the tyres they had to race on too.